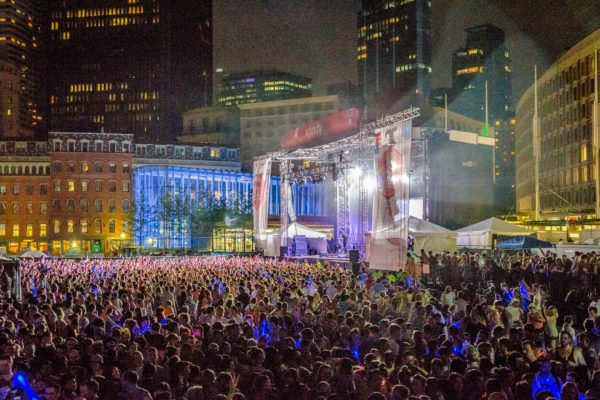 Boston Calling kicked things off on Friday, May 28th, 2016 with three fantastic sets by under-rated singer/songwriter Lisa Hannigan (and Aaron Dessner), the very popular indie artist Sujfan Stevens and the global superstar Sia. Of course, the artists are only part of the festival experience. Equally important to any good festival are the people in attendance and this edition of Boston Calling once again had peaceful vibes, everyone there to have fun, soak up the sun and enjoy music. With many general admission concerts you get a lot of pushing and shoving and people being crushed in the front but these things did not happen at Boston Calling, not this weekend and, come to think of it, not at the previous three editions of the festival I covered either. This is surely in part due to the presence of the Boston Police, the shows unsung heroes, as well as the many festival security guards and staff. Another thing that made the festival a hit was the food and beverages, of which there was much, some of which came courtesy of Ruth’s Chris Steakhouse, Zinneken’s Belgian Waffles, Tasty Burger, Whole Heart Provisions, Arancini Brothers, Firefly’s BBQ, Wine Riot, Sam Adams, Copperdome Crust (pizza) and several delicious lemonade stands. Suffice to say no one went hungry or thirsty. Speaking of which, there was free water available to all who wanted or needed it courtesy of the Boston Water Department. All in all, a great time was had by all. Below are my reviews of Friday night’s shindig. I was a fan of singer/songwriter Lisa Hannigan and her slightly smokey voice prior to seeing her perform with Aaron Dessner, having been a big fan of her Passenger album and other things she’d done, like her Daytrotter and Live From The Artists Den sessions. I had not, however, heard of Aaron Dessner, who must have been one of her musicians because she was the only one singing lead vocals and the only Aaron Dessner I could find on Spotify was a classical music artist and, no, she wasn’t performing with a string section, just simple acoustics for the most part. 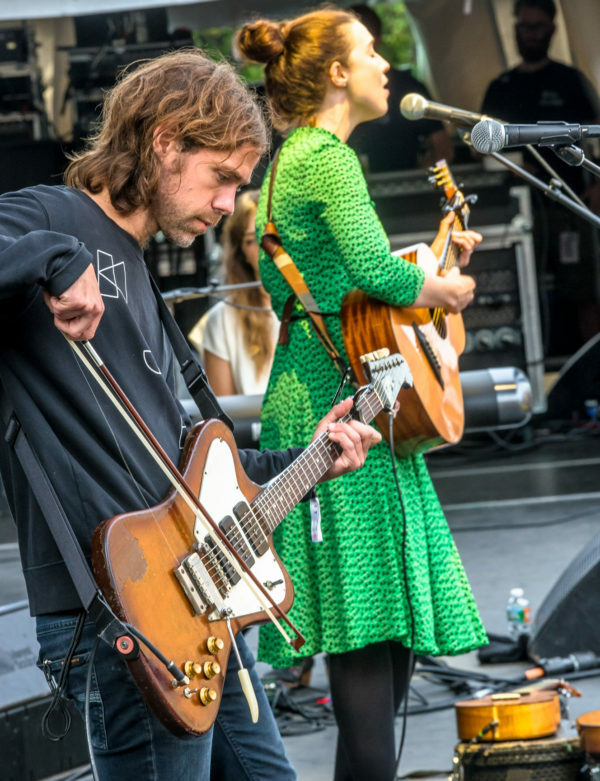 In any case, Lisa kicked off Boston Calling with a relaxing set of tunes, the perfect music for lulling people past the gates and straight to the stage, many of which were from the Passenger record. To that end, she drew one of the biggest crowds I’ve seen for the first act at the festival – this was my fourth time covering it, as a lot of people turn up a bit late on Friday night after getting out of work and commuting to Boston the festival or just being stuck on an hour subway ride. All I know for sure is that hundreds of people arrived early and everyone seemed to have a positive reaction to Lisa’s music. I wasn’t sure what to expect from prolific singer/songwriter/multi-instrumentalist Sufjan Stevens at Boston Calling. Rather, I wasn’t sure if I would enjoy his set, which was largely due to the fact that my favorite thing he’s done is his electronic album, The Age Of Adz, and Sufjan’s music usually isn’t electronic. Instead, he tends to craft his songs with acoustic guitars, banjo, and xylophone. 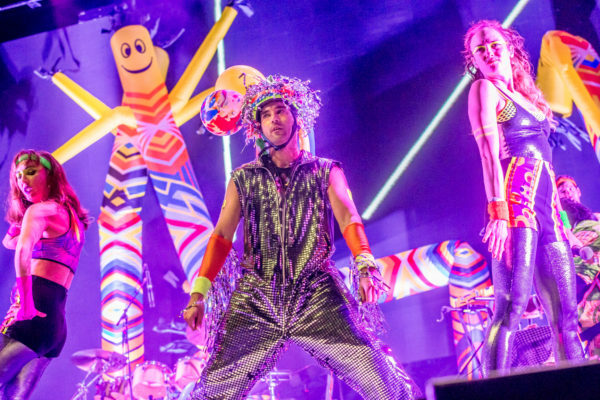 His live set at Boston Calling, however, was performed with a larger than life band, mostly clad in bright neon clothing that looked like it was straight from the ’80’s (in a good way). Honestly, it was the most fitting David Bowie tribute I’ve seen since his passing, even if it wasn’t actually a Bowie tribute; his influence was clearly there though. Sufjan opened with huge renditions of “Seven Swans” and “Too Much” before saying, “I think I’ve earned the right to sing a song about Dad,” before playing an acoustic version of “All of Me Wants All of You” from his latest album, Carrie and Lowell. Although, to be sure, it wasn’t an acoustic rendition in the sense you might think; you see, his Carrie and Lowell mostly consists of Sufjan and his acoustic instruments. Other songs he performed from the new album were “Should Have Known Better,” “I Want to Be Well” and “Carrie and Lowell,” although those were done with more instrumentation than on the album. One of the additional highlights of his 12 song set was “I Walked,” which he performed live for the first time since 2011. For me, the biggest winner was his closing song, “Chicago,” which was as loud and lively as the city itself. I’ve been a fan of Sia since I first heard her song “Breathe Me” in 2004 and immediately went out and purchased the album, Colour The Small One. 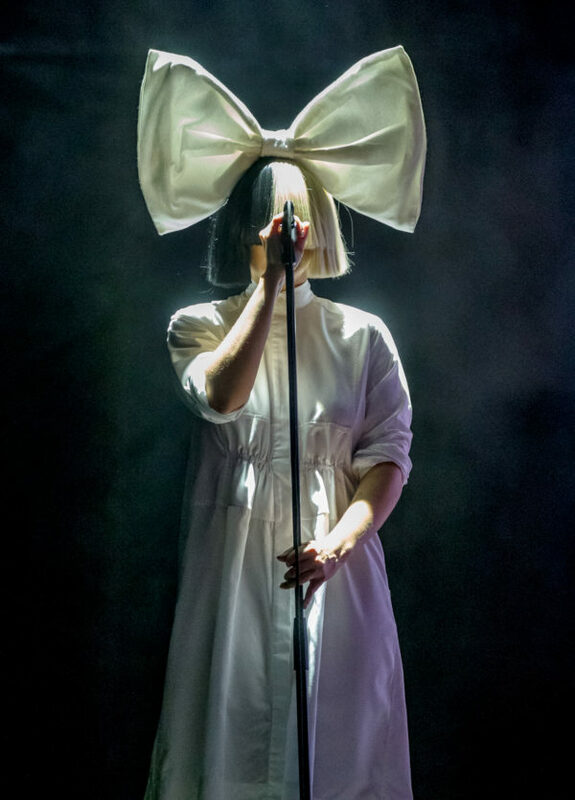 I did not know what I would think of her Boston Calling set, however, due to the fact that I much prefer Sia’s earlier albums over her more recent albums like 1000 Forms of Fear and This is Acting, the latter being her new album. There’s no denying that those are great albums, just less personal – every song on This is Acting was written with or for another artist and ultimately not used – and more over the top. To that end, she opened her set with a sonorous rendition of “Alive” from the new album, which was co-written by Adele and the under-rated Tobias Jesso Jr, then surprised everyone when she did “Diamonds,” the Rihanna hit that Sia co-wrote for her. I was quite surprised that she did it because the song ultimately wound up being credited to three additional writers. Still, there’s no denying that it turned out to be a stunning song and Sia’s version totally won me over. In fact, after that I found myself enjoying her entire set even though it focused on the newer tunes like “Cheap Thrills,” “Big Girls Cry” and “Bird Set Free.” She did, however, deliver a lovely rendition” of “Breathe Me” late in her 12 song set before closing it out with “Titanium,” her David Guetta collaboration, and the mega-hit “Chandelier.” My only complaint was that she didn’t perform with a live band. All of her music was pre-recorded. Instead of musicians, she had a few dancers dancing in front of her (pictured below), one of which was the girl who’s been dancing for her for quite some time now (so far as I could see from the distance). As for Sia herself, she did face the audience this time around, but wore a wig that covered her eyes and nose. Visit Boston Calling’s official site. Sia is the ultimate sellout. Sorry.